(Written 3 April 2008. Consult 'Investment Approach' tab for outline of what criteria gets a firm on the research list). Quantitatively 55/100 on the recorded 2007-over-2006 accounting data. Qualitatively needs much narrative. Diploma is a ‘large’ small cap and an acquisitive distributor of specialist materials. The company spent over £30m on four business in 2007 and inventory turns, return on assets and short term liquidity are under pressure as a result. This accounts for the 55/100. 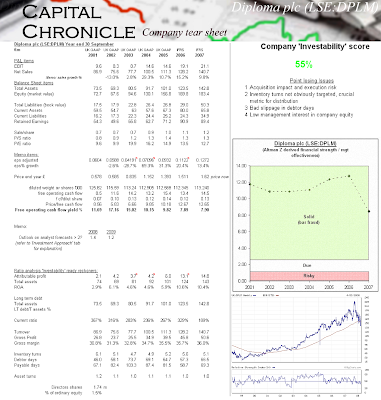 But a longer term analysis (the tear sheet covers the 7 years since it transformed itself completely into its current form) and a glance at the share performance shows it to be a financially robust cash generator, ungeared and an excellent investment at the right price – possibly even in the face of an economic slowdown. Which, in historical terms, is about 20% less than where it is now (158p). The company is due to report its interim numbers on 12 May. 3) Controls: UK and German macroeconomic growth are the key drivers (with one so far offsetting the other this cycle). A niche focus on defence, motor sport (including F1 and NASCAR) and aerospace provides some insulation from the cycles. Turnover of £60m (43%); FCF £9.9m (48%). The temptation is to underestimate the defensiveness of the sum; yet the shares have a beta of 0.5 and the long term graph shows an equity doing the opposite of the market during the 2000 to 2003 bath. Admittedly, that was not a classic industrial recession; but the point bears scrutiny. In ratio terms, the longer-term performance of the firm as it has existed in its current form is mixed. ROA and gross margin improvement has been excellent; but inventory turns and cash collection merely average with no discernible focus. Yet this is still a company with no debt and strong free operating cash flow generation currently yielding almost 8%. Other things being equal, should that yield rise 2.5 to 3 points, thus providing some margin of comfort in uncertain times, it would make the buy case look very attractive. That equates to a share price of circa 120p to 125p; and the technicals do not suggest that level to be out of reach. Finally, value buffs may be interested to note the directors are currently valuing 150 acres of land in Lincolnshire (owned since 1973) at £500,000, but nil on the balance sheet. In 2003 7 acres were sold for £2.6m; in 2004 7.9 acres for £4.2m; and in 2006 12.2 acres for £11.5m (all stripped out of the tear sheet data). The land is mainly agricultural and although the 2005 accounts state some of it may be suitable for development by this year the Directors were saying it was not for sale in the foreseeable future. Feel like timing the UK retail sales cycle?